Thanks to the advancements in AI and ML, bank work can now be done with the click of a phone button! Innovations in the field of customer services form an important part of the technology overhaul. The banking sector is making hefty investments on AI technology to simplify user experience and enhance overall performance of financial institutes. 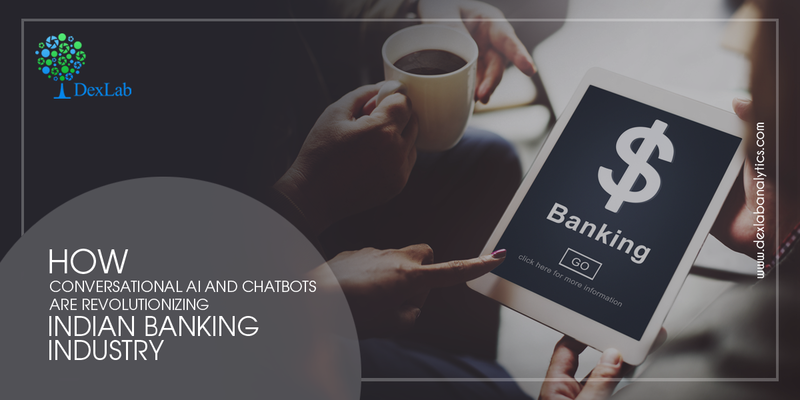 Let’s take a look at how conversational AI and chatbots are revolutionizing the Indian banking industry. Keya is the first AI-powered chatbot in Indian banking sector. It is incorporated in Kotak’s phone-banking helpline to improve its long-established interactive voice response (IVR) system. ‘’Voice commands form a significant share of search online. In addition, the nature of the call is changing with customers using voice as an escalation channel. Keya is an intelligent voicebot developed keeping in mind the customers’ changing preference for voice over text. It is built on a technology that understands a customer’s query and steers the conversation to provide a quick and relevant response”, says Puneet Kapoor, Senior Executive Vice President, Kotak Mahindra Bank. Akhil Handa, Head of Fintech Initiatives, Bank of Baroda said that their chatbot will manage product-related queries. He believes that the services of the chatbot will result in better customer satisfaction, speedy responses and cost minimization. Lakshmi, India’s first humanoid banker is a responsive robot powered by AI. It can converse with customers on more than 125 topics, including balance, interest rates and transactional history. Digital platforms of SBI, like SBI inTouch, are utilizing AI-powered bots, such as IBM Watson, to enhance customer experience. SBI stated that modern times will witness the coexistence of men and machines in banks. Payjo is a top AI Banking platform based out of Silicon Valley in California. YES Bank has partnered with Payjo to launch YES Pay Bot, its first Bot using AI, which improves already popular wallet services. The YES Pay wallet service is trusted by more than half-a-million customers. YES TAG chatbot has been launched by YES Bank and enables transactions through 5 messaging apps. Customers can carry out a wide range of activities, such as check balance, FD details, status of cheque, transfer money, etc. It is currently used in Android and will soon be available on Apple App Store. Asia’s largest bank, DBS Bank, has developed Digibank, which is India’s first mobile bank that is ‘chatbot staffed’. It provides real-time solution to banking related issues. This chatbot employs a trained AI platform, called KAI, which is a product of New York startup- Kasisto. Axis Bank facilitates smart banking with the launch of a chatbot that employs conversational interface to offer interactive mobile banking solutions. This intelligent chatbot was developed in association with Singapore based AI company- Active AI. To enable smooth ecommerce and banking transactions, HDFC in partnership with Niki.ai has launched a conversational chatbot, called OnChat. It is available on Facebook messenger even to people who aren’t HDFC customers. Users can recharge phone, book cabs and pay utility bills through this chatbot. EVA is exclusively for the customers of HDFC Bank. It is an electronic virtual assistant developed in partnership with Senseforth, an AI startup based in Bengaluru. mPower is a chatbot for loan products that has been developed by YES Bank in association with Gupshup-a leading bot company. It assists customers on a variety of loan related topics like personal loans, car loans and loan against securities. In the future, there will be three kinds of bots- speech-based bot, textbots and video chatbots. Conversational bots work in harmony with human employees to enrich customer experience. Thus, AI-powered technology is the way forward. To be industry-ready in this AI-era, enroll for the Machine Learning course in Gurgaon at Dexlab Analytics. It is a premier Analytics training institute in Delhi. To learn more about Data Analyst with Advanced excel course – Enrol Now. To learn more about Data Analyst with R Course – Enrol Now. To learn more about Big Data Course – Enrol Now. To learn more about Machine Learning Using Python and Spark – Enrol Now. To learn more about Data Analyst with SAS Course – Enrol Now. To learn more about Data Analyst with Apache Spark Course – Enrol Now. To learn more about Data Analyst with Market Risk Analytics and Modelling Course – Enrol Now.